IFA 2014: Onkyo unveils high-res streaming CD player and micro systems | What Hi-Fi? Onkyo has announced the launch of the C-N7050, described as its first-ever hi-fi source that brings together CD playback and high-res music streaming from media servers, PCs and mobiles. Also new are two Colibrino mini systems. 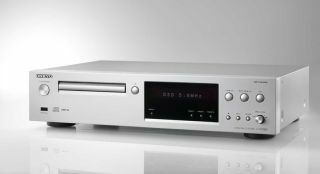 The C-N7050 network player has been constructed around an anti-vibration metal chassis, uses a floating 32-bit digital signal processing engine and TI Burr-Brown's high-end PCM1795 32-bit digital-to-analogue converter. Native DSD and 192kHz/24-bit FLAC files are supported by Onkyo's new device, along with other high-res, lossless and compressed formats. DLNA technology is on board, too, which allows you to stream and control music from a mobile device. Onkyo's Vector Linear Shaping Circuitry (VLSC) has also been used to remove "high-frequency pulse noise from digital recordings", which the firm says is designed to deliver a cleaner and more natural sound. Internet radio comes courtesy of the vTuner internet radio service and there's a USB port on the front panel allowing direct-digital connections between the C-N7050 and Apple devices. Other compatible devices can be connected using either the front or rear USB ports, while you'll also find optical and coaxial outputs; analogue output terminals; and RI compatibility for integrated control of other components. Onkyo has also unveiled the new CS-265 and CS-265DAB Colibrino CD mini systems, which sport wireless Bluetooth and NFC technology alongside a host of typical all-in-one system features. The firm has increased power by 25 per cent to the latest additions to the Colibrino range, which now offers 20 watts per channel at 6ohms. A full digital processing system and digital amplifier can also be found on board. Each of the two-way bookshelf speakers comes with a 10cm cone woofer and 2cm balanced dome tweeter, while a direct-digital USB connection lets you connect your Apple device – either via lightning or legacy 32-pin Apple connection. A new disc-reading mechanism has been deployed to reduce CD load times and both systems offer MP3 playback from USB devices. Unsurprisingly, the CS-265DAB indicates that it has a DAB+ tuner with 40-present memory.